Talbot represents organic folk that's closer to the truth than umpteen fellow artists' assorted endeavors. If anyone that were a part of the modern music scene were to claim that they more fully-encompassing of the pursuit of a traditional American dream than Nathaniel Talbot, one would have to be forgiven for initially thinking them as liars. When he isn’t writing and performing songs, Nathaniel Talbot is running an organic vegetable farm on Whidbey Island in his home state of Washington. 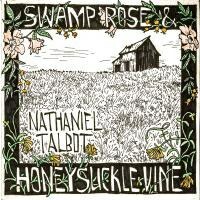 Wherein the term “folk” has expanded to encompass a wide variety of alternative sounds, Talbot develops conventional, acoustic-driven music on the aptly-named Swamp Rose and Honeysuckle Vine, inspired by the lush natural scenery present throughout his childhood. From his timbre to his delivery, his persona comes across as very James Taylor-esque, but with storylines originating from a hiraeth towards nature, there’s enough room for two bards of this flavor to exist without the other coming about as redundant. All in all, Swamp Rose and Honeysuckle Vine is a crack folk record worthy of an ear, closer in meaning to the roots of the genre’s soil than many other efforts of recent years.